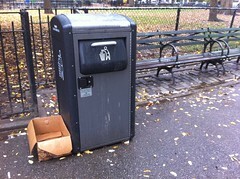 Curious about the imposing trash cans that appeared in Tompkins Square Park recently? The Villager has the story: The so-called BigBelly, three of which have been installed in the park along with others in Chinatown and elsewhere, is a solar-powered trash compactor that crushes litter with 1,250 pounds of pressure. According to the Villager, it “holds five times the amount of garbage as a traditional trash receptacle and can reduce trash collection by 80 percent,” and uses wireless communication to let its Massachusetts-based parent company know when it needs to be changed. The good news: It’s said to curtail rat infestations.